So, you might ask, how does one know what resources to make that will sell? That will appeal to many? Well, it certainly helps to be a K-2 teacher, as schools generally don’t provide much in the way of resources and curriculum to those grades. Those teachers are usually the most successful online. However, I’m happy to say that all grade levels have grown in appeal to those who have so much on their plate, and more added every day. 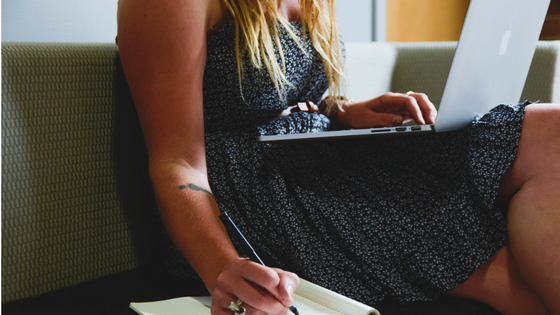 There are sellers who market to middle and secondary teachers and do very well, offering materials that mainstream curriculum companies do not realize need to be made available. I was fortunate in that, my launch into providing resources online coincided with the Common Core Standards launch. So many standards, so many new ways of teaching concepts, so little time. It wasn’t long before it was clear that teaching to the standards, and ensuring students would be ready to answer state assessment questions, revealed a true lack of resources that were helpful to teachers. Curriculum companies were rushing out whole programs without due diligence, mistakes rife throughout. Eventually, my students knew to say “Ship it” when they saw, yet again, an error in the workbook, a reference to a line from “Elf” where an editor didn’t care that the book didn’t make sense. One of the standards for sixth grade involved creating tape diagrams to solve ratio and proportions problems. Incredibly helpful visual for understanding the problem and then solving, but oh-so-difficult to teach if you didn’t understand it upside down and backwards yourself. So I worked long and hard on creating something that taught it step by step…not because I didn’t think a teacher could teach it, but because I wanted to make something that I would buy myself. I wanted to make something that a teacher who just found out that they were being shifted from first grade to sixth grade could use at the drop of a hat. I wanted to make something that a teacher could leave for a substitute and there wouldn’t be the slightest hiccup. I wanted to make something that a teacher who was trying to get her kids ready for bed, make lunches, and collapse on a sofa on a Sunday night could use. And that’s why I’ve made all of my resources. Helpful for people like me, very detailed, always with a detailed answer key, and quintuple-checked for accuracy. Because, hey, who wants to buy something that they have to correct? Or wonder about? And that’s the best advice I will ever give anyone when they decide to create something for another teacher. Make it for yourself first, and make it as complete as possible before uploading. You’ll be very happy that you did! 1) Students move around room, asking their classmates to answer a square on their board. That student will write the answer on the square, and then initial or write their name. Students should have a slate or paper to work out an answer, if needed. 2) Students only sign name on the square they can answer. Each student may only answer one square for any one student. If you have more than 24 students (there is a Free Space), then adjust so that a student can ask a classmate for the answer to a second square. 3) This process can take 25-40 minutes, depending upon class size and levels of ability. 4) Once all squares are filled in, students sit and the teacher uses a tool like the Random Name Generator (www.superteachertools.com) to call out student names (any technique you normally use works for this). Students place a marker on the name where it appears on their card. 5) A student can call bingo after 5 spaces are marked in a row. 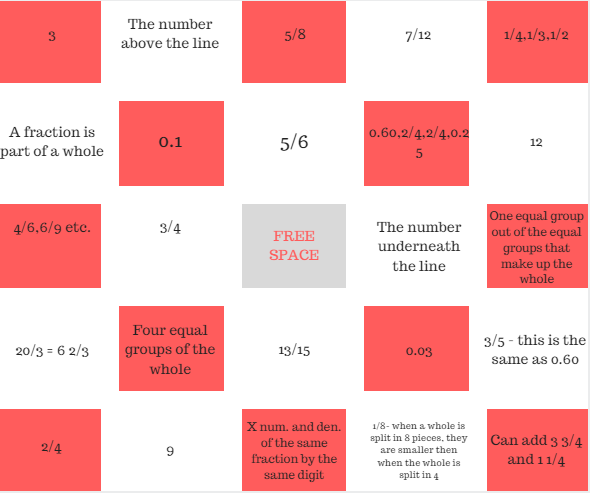 However, students whose names appear on each square must then be able to respond successfully to the fraction question on the square for bingo to be successful. 6) I keep small treats available for the numerous winners. You can continue the same game once a Bingo has been called, or you can clear the boards and begin again. 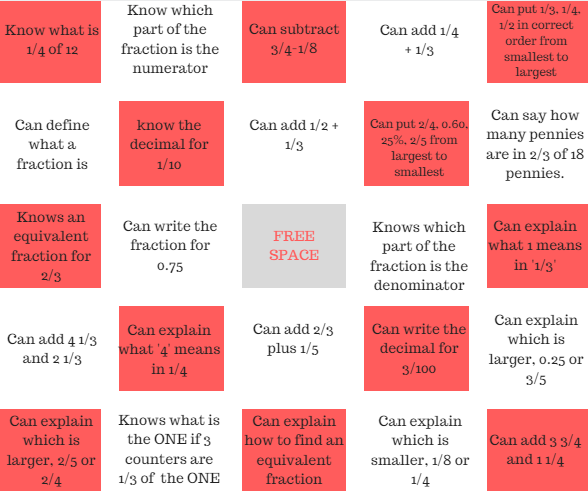 7) This is an effective summative activity for fractions and acts as a review for both when the students are asking their classmates to answer a square, and when we go through the answers after a Bingo has been called. 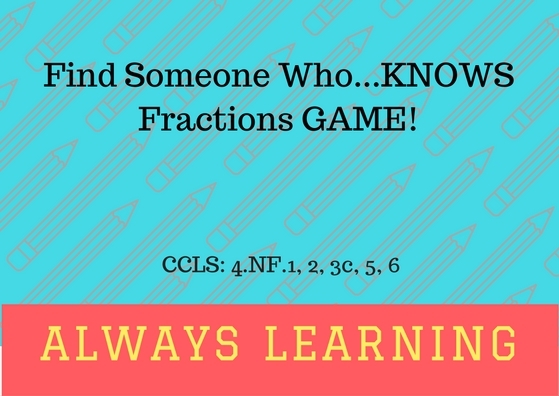 Let me know in the comments section below what you think and how the FRACTION GAME turned out for you. AlwaysLearning is run by an English Language Arts teacher, living and teaching in New York State. She has taught English, Math, American history, and ancient history for fourteen years, to both fourth and sixth graders, and has found that creating engaging educational resources has reignited her love for teaching. She enjoys both the art and science of teaching, believing nothing compares to that moment when a student's eyes light up and the 'aha' appears!